Sean Fleming likes to play music. Doesn't matter where, doesn't matter when. Back in 1969, Fleming sat in a helicopter flying high above war-torn Vietnam. He and the pilot were trying to locate some troops that he was supposed to entertain. As they searched, Fleming daydreamed of what could have been - what should have been. Just a year and a half earlier his life was full of promise. He had appeared on the Merv Griffin show several times and had signed a record and a movie deal with MGM. With any luck, the talented musician and singer was on his way to fame and fortune. "I was a resident alien and back then you could be drafted if you had a green card," said Fleming, who hails from Country Kerry in Ireland. "I spent the next two years in the Army." Making the best of a bad situation, Fleming, who was already proficient on the accordion, learned to play the guitar while in the Army. "I would play for guys in the MASH units from time to time," said Fleming. "One day, General Hayes, a woman who was the head of the Army Nurses Corp, saw me perform and told me that what I was doing [with the guitar] was more important than what I was doing with an M-16. So for the last five months or so I played for the troops. But even that was extremely dangerous. Often times it was just myself and a pilot in a helicopter flying around looking for US troops in places that you wouldn't think troops would be. We would radio ahead and ask them to send up smoke to let us know where they were located." Fleming survived the war, but his budding career took a major hit. "I was just glad to get out of there alive," Fleming said. "The first guy I shared a tent with never made it back. After I came out I had to start (my career) from scratch. Everything changes quickly in the entertainment business and when I got back things had changed dramatically." The calendar told him it was 1971, just two years since he'd made the last of seven appearances on the Merv Griffin show. But in show business, two years is an eternity, and Fleming found himself starting over, trying to work his way back to where he was before he got drafted. Once he had shared the stage with such notable performers as the Beach Boys, Della Reese and Rodney Dangerfield. Now, he found himself back in New York City performing a solo act. 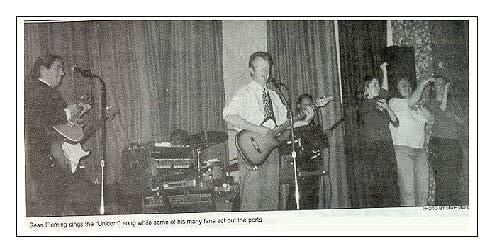 - just himself and an acoustic guitar - in small clubs and pubs. Eventually, he formed several bands and played several large venues including Carnegie Hall and Philadelphia's Robin Hood Dell. 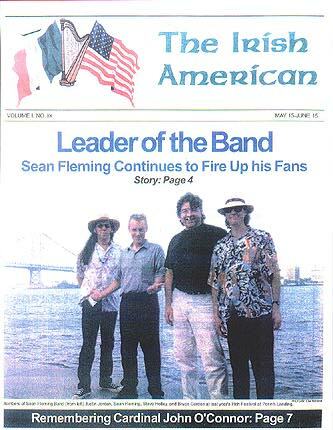 You can catch The Sean Fleming Band at the Bucks County Irish Festival at the Phoenix Club in Feasterville on June 4, and at the annual 2000 Irish Festival on June 17 - 18 at Penn's Landing in Philadelphia. Fleming who plays guitar, synthesizer and accordion heads up one of the most talented bands anywhere. On drums is Steve Holley, who has backed up some of the biggest names in music, including Paul McCartney and Wings, Elton John, Kiki Dee, Joe Cocker and Julian Lennon. On guitar is Justin Jordan, who has played with the likes of the Turtles (Flo & Eddy), the Shirelles, Joey Dee and the Starlites and Frankie Ford. And on bass is Bruce Gordon, who has recorded with Ray Davies of "The Kinks." Gordon, who started out playing blues and R&B in Buffalo, NY, has a diverse musical background. He was a member of the new wave band "The Screaming Honkers," which appeared in the movie "Ishtar," and has also performed in a country and western swing band called the Jazz Cowboys." 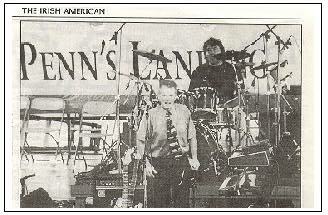 And, of course, there is Fleming, whose Irish roots help give the band a unique, hard-driving sound. Those who knew Sean Fleming as a lad growing up in a golf club house on the shores of the Lakes of Killarney, could never have imagined that he would end up performing in a Celtic rock band. A golf pro maybe. Fleming to this day is and avid duffer who has played some of the best courses in the world including Pine Valley in New Jersey. But a Celtic rock performer? Surely, he loved music, but in the beginning he played anything but rock and roll. "I guess I was about 4 or 5 when I got interested in music," he said. "I got a harmonica every year for my birthday and I'd found an old accordion in the closet and learned how to play that too. I was amazed at how easy it was for me to get a sound out of it. I went from that to the piano accordion and was a member of the Killarney Monastery Accordion Band, a group run by Brother Finian [of the Christian Brothers order]. We would play marches, semiclassical, waltzes - music of that genre. But certainly no traditional Irish music. In my opinion, it's really impossible to learn traditional Irish music through notes. You have to play it by ear, you have to live it." "I used to play a lot of traditional Irish music on the regular accordion. And when I came to New York I played for the dances and feises." "Playing for feises isŠ. well you have to have the patience of Job," he continued with a laugh. "I'd play the same song, 35 times for a group of 4-5 and 6 year old dancers. But I think that it's wonderful that the youngsters today are involved in Irish dancing and I encourage it. It's nice to see them keep the traditions alive." " I remember when I was growing up that people would go out on St. Bridget's Day. Guys would dress as girls and girls would dress as guys. And some people would put a little band together and go from house to house and sing a song. They'd get half a crown or whatever and take the money and have a Biddy Ball. That's where I got my traditional Irish music background." That background has served Fleming and his band well as his legion of fans continues to grow. Fleming, like many others, is quick to credit one man with the resurgence in the popularity of Irish music and dance. "Michael Flatley" Fleming said, referring to the originator of the wildly popular Riverdance. "There is certainly no doubt in my mind that Riverdance had a tremendous impact on Celtic music." "Before that you had groups such as the Pogues and the Chieftains, but they didn't attract as large an audience. I know a guy I Washington, D.C. who teaches Irish dancing. When I first met him several years ago he had four or five students. Now, He has over 325 and he's thinking of building has own studio. " "And it's not just Irish Americans that are involved. There are kids that have absolutely no affiliation with the Irish who are taking lessons. It's great." That non-Irish people are interested in Celtic music and dance doesn't surprise Fleming, who likes to listen to all types of music. If you were to see Fleming motoring about New York in his 1974 BMW 3.0 CS you might be surprised to hear what radio station he was tuned to. "You can tell a lot about a person by the pre-sets on their car radio," said Fleming. "My No. 1 pre-set on AM is National Public Radio. My No. 1 pre-set on FM is Fordham University's station, which plays everything from Irish music, Celtic music, American Folk music and the Blues. " "I also have a country pre-set, a cutting-edge rock and roll pre-set, a classical pre-set and a pre-set for the Fairleigh Dickinson University station which plays New Age music. I like a lot of different types of music because I an learn something from all of them." To date, Fleming has released four albums and written about "10 to 12" original songs. He's married to Liselotte, an exercise physiologist who has taught at Queen's College, who has started the Preschool of the Nyacks. They have three children, Dillon, 8, Anders, 5 and Elin, 2 and live in a beautiful home on a hillside off the Hudson River near Tarrytown, NY, about 25 miles from Manhattan. Fleming's career has taken him to just about every major city in the U.S. and he has played in Ireland, Japan , the Philippines and the Czech Republic. Raising a family has forced him to take another look at his career. Fleming said he no longer thinks about making it big. "If it happens, it happens," he said matter-of-factly. In the meantime, he's hoping to branch out into other areas. "I'm thinking about doing a children's album," he said. "And I've begun to think about writing [songs] a lot more ad having someone else - or perhaps myself - record them. I'm also thinking about putting together an Atlantic City act that I would do on a semi-regular basis, a couple of weeks at a time. "Sort of a Celtic-flavored Wayne Newton," he added with a laugh. Sean Fleming in an Atlantic City casino act? "I'm a large procrastinator," he said. "So who knows what will happen?" His career has taken more left turns that a race car driver in the Indy 500. Thirty-one years ago he flew in a helicopter over war-torn Vietnam looking for some troops to play for. Now the troops come to him - an army of loyal fans that show up wherever he plays. They listen to him and his band in spots such as Finnigan's Wake, Brittingham's and Callahan's. And at the Philadelphia Festival on Penn's Landing too. Who knows? Maybe someday the venues will become bigger. Perhaps Fleming will see his name on the marquee of an Atlantic City casino or even the First Union Center. For now, he's perfectly content, right where he is. Sean Fleming, you see, likes to play music. Doesn't matter where, doesn't matter when.